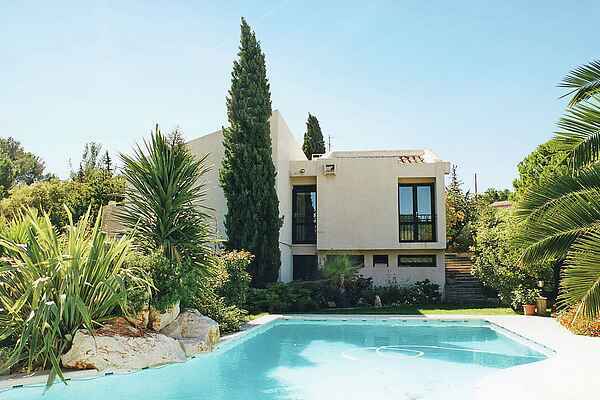 This modern vacation home is situated in the hamlet of Cournonterral, between atmospheric Montpellier (14 km) and the well-known beach resort of Sète (17 km). Here, a beautiful enclosed garden is at your disposal, wrapping around the house on three sides. It has a great lawn, trees , plants and several terraces that are great places to relax. Take a dip in your own private pool or relax in the sun on one of the loungers. At night the pool is beautifully lit! Cap off a long day at the beach with a gourmet meal cooked on your brick built barbecue! The interior has been carefully maintained and fully furnished, with air conditioning throughout. You'll have access to two bikes, ideal for exploring the area once you arrive! 700 meters from the holiday home, there is a bakery where you can get fresh croissants every morning. 1.5 km from the house, you can do your grocery shopping. Not to mention, you're just 12 km from the beach. A little farther, at Cap d'Agde (41 km), there is a water park. You should also visit the walled, medieval Aigues-Mortes (45 km)! Are you ready for a canoe trip? This can be done on the Hérault River (canoe rental in St. Guilhen, 41 km).